Hi this is Abby with the Blank Slate Sewing Team! For the holidays, I wanted something perfect for curling up by the fire with my kiddos or hitting the slopes. 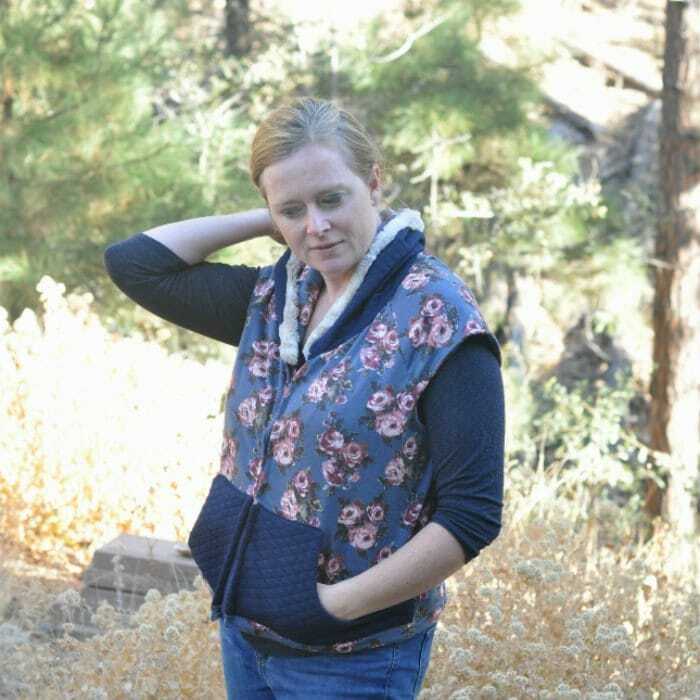 Tall order, but Blank Slate has tons of patterns at the ready and Melissa has so many fun hacks….I decided I would just double-up on her hacks with an athleisure style raglan vest using the Zinnia Jacket. Because I live in the Sonoran Desert of Phoenix, our “winter” calls for lightweight sweaters. It does get chilly on early morning hikes or evening jaunts for our favorite holiday events, like the Luminarias at the Desert Botanical Garden. Travel tip – if you ever find yourself in Phoenix over the holidays, or really anytime, the DBG, as locals call it, is worth a stop! Even though I do not “need” much in terms of winter gear, I LOVE winter gear, so I decided to make something cute and functional in our climate, but also festive. To achieve this trifecta of holiday wear, I began with the lovely Zinnia jacket, which features a slim silhouette and raglan sleeves. You can see Melissa and Blank Slate Sewing team have used this wardrobe workhorse over and over again, again, and again. 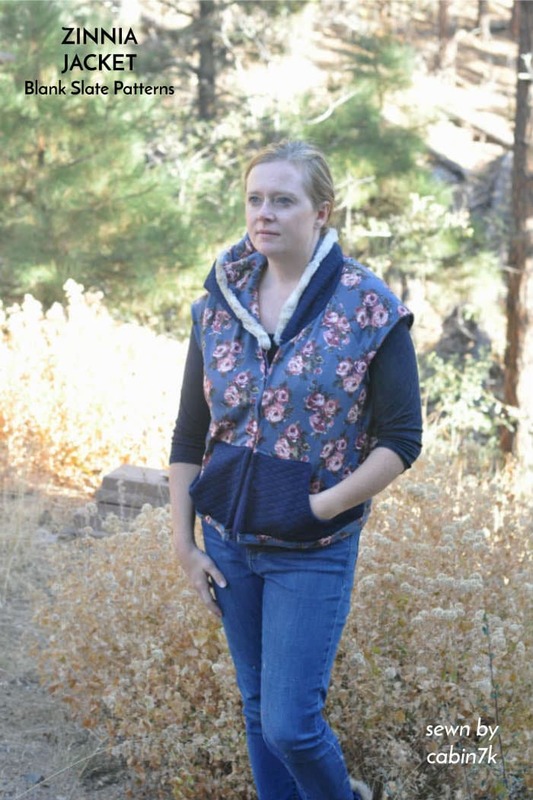 Lately, I’ve noticed a lot of raglan style vests; often in athleisure wear. Building on this idea, I hacked the raglan Zinnia. I adjusted the sleeve length just enough to finish at the bottom of the armscye and cover the end of my shoulders by about an inch or so. Instead of bands (common in some vest patterns), I hemmed, which kept the width of the “sleeve.” I really like this sort of 1980s cut-off sweatshirt look. Post-holidays when we’re talking workouts and resolutions, I may do a raw edge raglan vest to achieve a perfect Rocky type look! I’ll just need some Eye of the Tiger and I’ll be on my way to running off that pumpkin pie and stuffing. To make this slightly baggy vest, I sized up one size. I wanted it cropped to hit just at my waistband, so I shortened the bodice length by about 1/2 inch. I also reduced the width of the bottom band by approximately 1 inch. Because I prefer a looser neck and wider opening for layering, I cut a triangle wedge out of the front bodice piece. Then I hacked two of Melissa’s hacks, so is that a double-hack2? 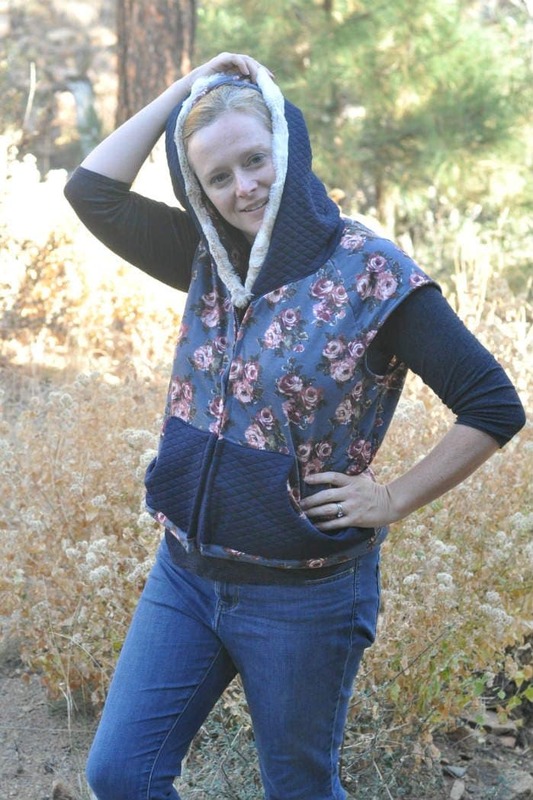 The first is the free hood pattern and tutorial, which I lengthened to fit the new opening with the wedge cut out. 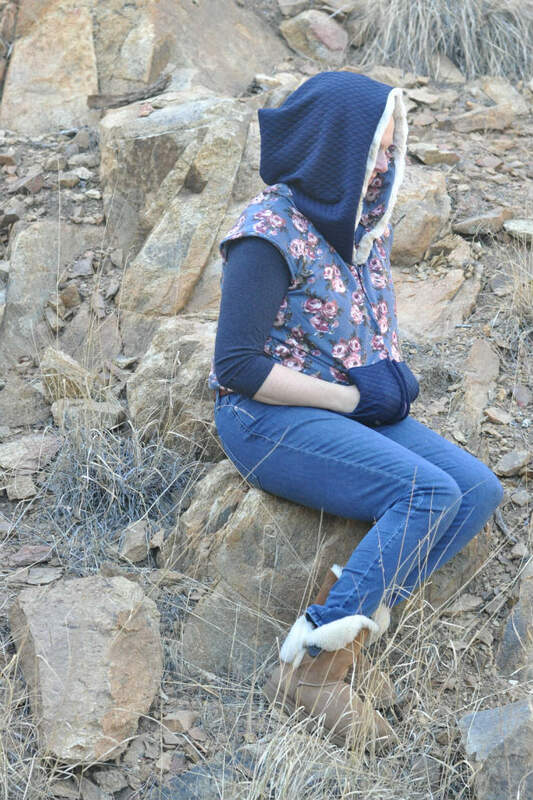 I also exaggerated the hood by extending the back curve to make it oversized. Then I added a faux fur trim piece. 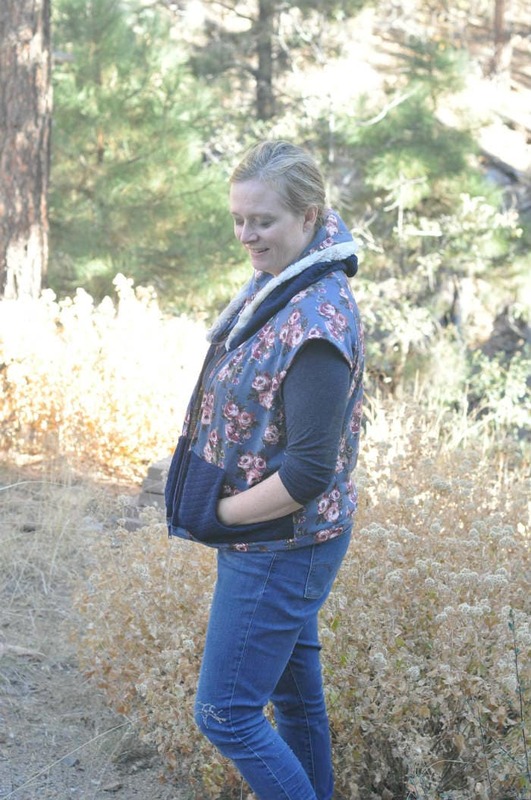 Next up was the hack of the kangaroo pocket by Sew Charleston. I extended the kangaroo pocket all the way to the side seam to make the side a bit more streamlined. I used a beautiful, polyester/spandex quilted jacquard fabric from Raspberry Creek Fabrics. The quilted jacquard instantly gives this an outerwear look and is so classic. The main fabric is an absolutely gorgeous floral French terry, also from Raspberry Creek. 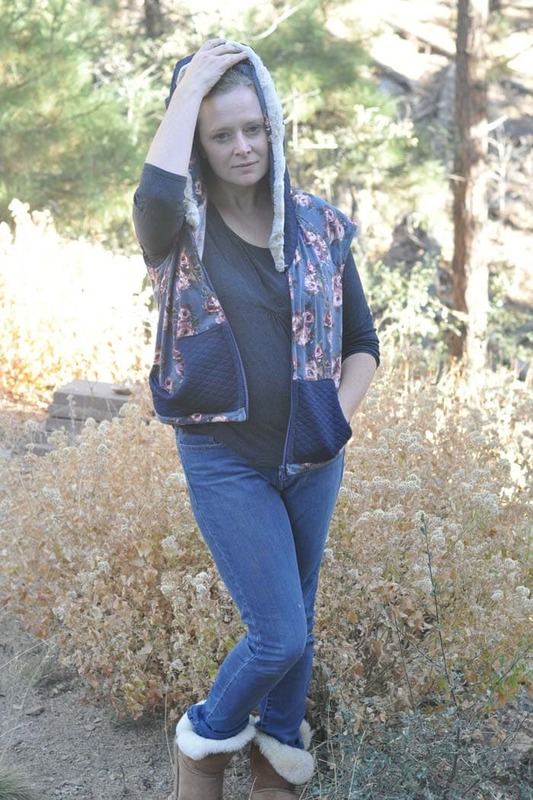 With my oversized faux fur trim hoodie, the Zinnia vest feels festive. 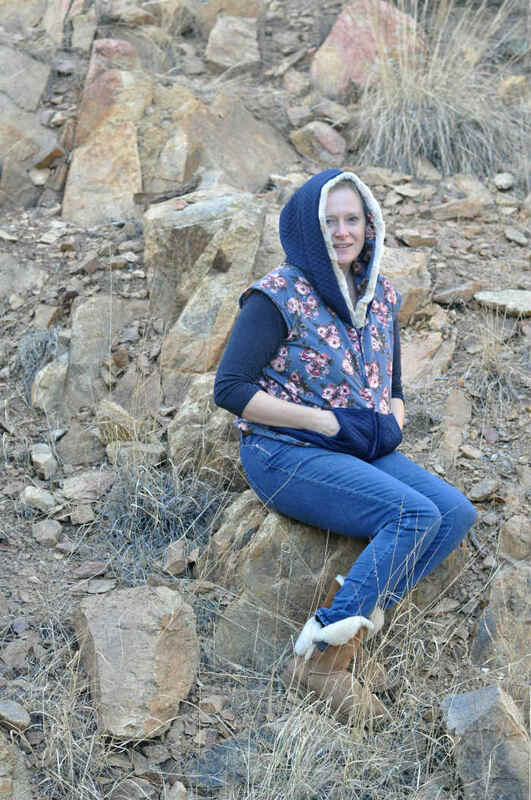 I can wear it as my outer layer in the desert for a night of holiday fun or as a cute layer for trips to the mountains!